After a day of snorkeling on the beach in Eilat (which has gorgeous coral reefs right off the shore, but there isn’t much to say for the town…), Jon and Jahan had to head back north to Tel Aviv, but they offered to drop me at the border on the way so I could continue on to Jordan. 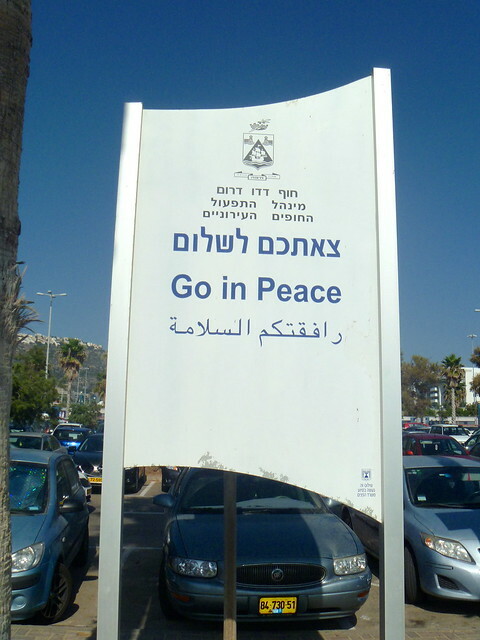 The Yitzhak Rabin border crossing connects Eilat, Israel with Aqaba, Jordan and was just 3km out of town, so we were there in no time. We said our goodbyes, took one last group selfie (someone still needs to send me that shot! ), and then I went through the gates. I was expecting the worst, but it was actually a fairly painless and organized operation. They even had a guard at the first gate who was extremely friendly and explained which window I should go to first, where to head after that, etc. There were only a few other people there so it was pretty quick too. First stop: Paying the Israeli exit tax of 107NIS. I also changed most of my shekels into Jordanian dinar at the same window before continuing on to get my stamp out of the country. At the next window, I showed my payment receipt, which they stamped with an exit stamp and then also stamped a separate piece of paper and tucked it all into my passport. Since this is the last trip I’m taking on this passport (it expires in February), I almost wish I could have the dreaded Israeli stamp in it, but they just don’t do it by default anymore. It’s always a separate piece of paper that you’re liable to lose — they don’t even staple or clip it in or anything. 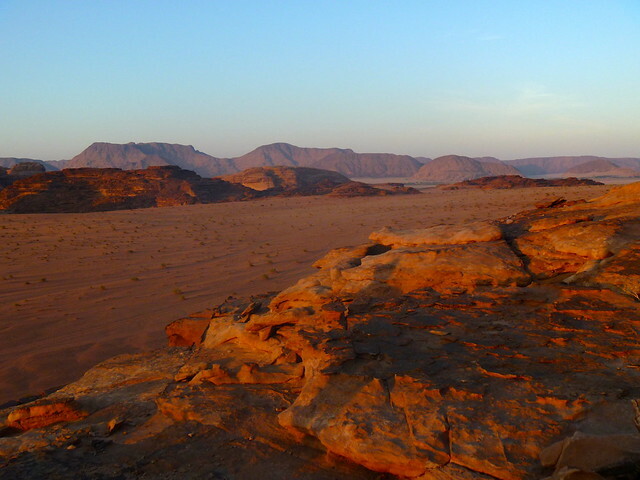 I passed through the duty free shop and exited at the last Israeli security post, where a guard cursorily checked my passport and various scraps of stamped paper once again, then walked the 5 or 10 minutes across the barren desert of no-man’s-land. 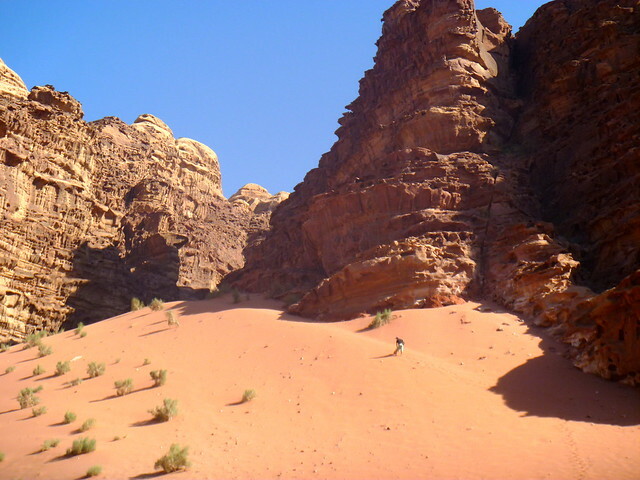 Along the way I met a French couple who was planning to spend the night in a Bedouin camp in Wadi Rum, which sounded more fun than the prospect of staying in Aqaba, which I suspected was very similar to Eilat. They invited me to join them and offered to call the camp for me once we got to the other side to see if they had any availability. Once we reached the Jordanian side of the border, a guard inspected our exit paperwork from Israel and then sent us through a metal detector and our bags through an x-ray machine. Pretty sure he had just woken up from a nap and wasn’t even looking at the screen, but that was fine for us as he sent us on our way. We easily figured out which window to get stamped in at (the only one with several people in line) and waited our turn. This official went through my passport with a fine-toothed comb and was very interested in some of the different visas I had, and then looked slightly offended when he asked if I spoke Arabic and I said no. I quickly followed up with “But I will have to learn some while I’m here!” and a smile. He was pretty friendly after that. Officially in Jordan, my new French friends changed their money into dinars as well. (Supposedly you get a better rate on the Israeli side if you’re changing shekels, but the rate on the Jordanian side is better if you’re changing euros or anything else.) 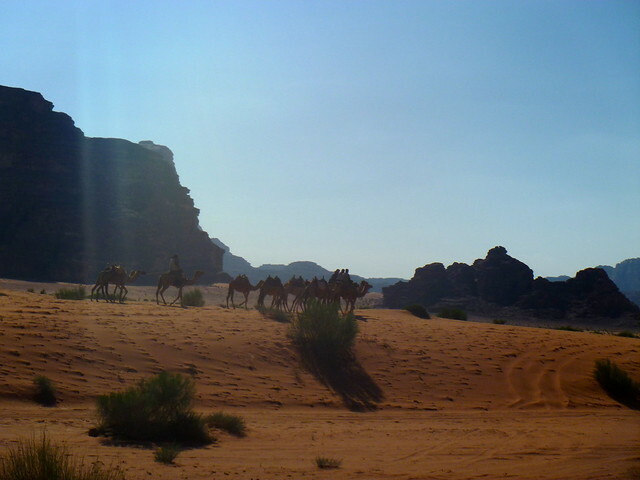 Then we stood in the parking lot trying to call the owner of the Bedouin camp on a lousy connection while taxi drivers gathered around us, looking for a fare. Having quickly established that they had safely crossed the border and were on their way to the camp, my friends passed the phone to me. It took me a few minutes to understand what was actually being said through a heavy accent and garbled connection, but I managed to get across the point that I was looking to stay in a tent for one night, maybe two, and yes, I wanted my own tent, not to ruin these people’s romantic vacation by crashing in their tent. Eventually I heard “25JD, private tent, includes breakfast.” Okay, I can do that. 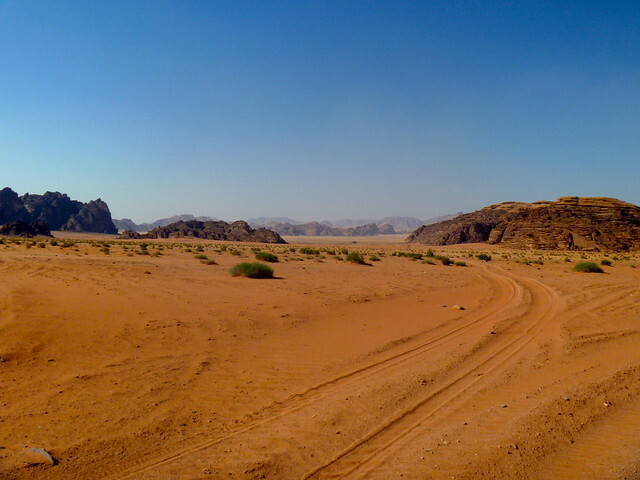 We hopped in a cab and were on our way to Wadi Rum!